Phillippe could still remember the day he learnt an important lesson as a young boy. It was a day he lost some innocence. He was running down the street in the warm morning sunshine. His skinny legs pounding hard on the pavement, full of joy with his new shoes and the wonder of the task he had been given. Collecting the morning bread was what John had done, but his brother John had left home to get work and Phillippe was the boy of the house now. It had just happened that day. The baton had been passed. In a very literal sense had the baton been past. Even as a five year old boy he understood the significance. He carried the baton under his arm. A still warm loaf of crusty bread was on show for all the world to see. Look! This boy is now a baton carrier for his family, people would say. He lifted the bread to his nose occasionally to smell that aroma of importance. Just like his father he also put bread on the table. He had often heard his father make his proud boast. Now he would be his father’s partner, just like John had been. Soon Phillippe would be a man like his brother and his father. Perhaps he was already one or would be by the time he got home with the baton. He ran like the wind to get home to show his father and his mother what he could do. He was just like John his big brother they would say. Now Phillippe was the boy of the house with new responsibilities and the shoes to match. He liked dogs and usually saw them coming from a great distance, but not this dog. He did see the cat though. He dodged the cat as it ran past. Phillippe was good at dodging. He watched it scurry under a parked van, but as he did so he had his head turned and didn’t see the dog chasing after the cat. Then everything was a chaos of dog, bread and boy. He remembered the dog yelping with surprise as this small boy collided with his flank. Next he remembers lying on the pavement with blood coming out of his nose and a terrible pain in his hand. The baton was broken in two and lying on the pavement beside him. Looking up he saw O’Shea looking down at him. O’Shea was the grocer’s dog who came to his house with the weekly delivery. He was a big collie type dog who was usually fun to be with, but not today. He remembered that O’Shea hated cats and when they were around O’Shea was a very serious dog. He got angry with the nonsense cats caused. Just now O’Shea looked embarrassed more than angry. Then without warning O’Shea grabbed one of the halves of the broken baton of bread and ran off with it leaving the other half on the pavement beside Phillippe. In a blind panic Phillippe sat up and grabbed the remaining half with his good hand. Hot tears flowed down his cheeks and mixed with the blood from his nose. All he could see was the broken baton clasped in his good hand. The pain of his disappointment was worse than any physical pain. How could this be? How could O’Shea be so bad? All he could feel was this huge lump of sadness in his chest and all he could hear was his parents’ disappointed tones. He had lost the baton, well most of it and the piece he had left was all dirty. It would never do for bread on the table. 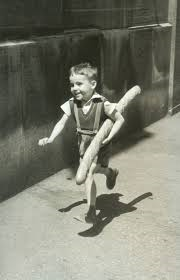 He remembered the long walk home with the broken bread. The day was no longer filled with joy. His feet were heavy and everything hurt. He was a big failure and would not now be the boy of the house because he didn’t put bread on the table like his big brother. By the time he reached his house his sadness was replaced by anger at O’Shea. O’Shea would have to take the blame. Not him. His father would have to go and see the grocer about his dog’s behaviour. As he entered his garden Phillippe saw O’Shea sitting on his front step. The dog still had the other half of the bread in his mouth. When O’Shea saw him he wagged his tail, put down the bread and barked a greeting. O’Shea obviously felt he was making amends for the awful thing he had done. Boy and dog stared at each other waiting for something to happen to resolve the dilemma. They both looked at the two halves of the broken baton wondering what could be done. Something welled up in Phillippe. Suddenly the silence was broken by Phillippe high pitched scream. “O’Shea, you big stupid dog. I’ll get you. I really will.” He yelled. He launched his small body at the large dog. O’Shea abandoned his half of the baton and ran for the gate in shock while the other half of the baton was aimed carefully at his retreating behind. Many years hence the lesson learnt by Phillippe was still with him. At the time he did not fully grasp it at the time. That evening when his father sought to comfort him the words he used only made sense many years later.